Every year when Halloween rolls around we all face the classic dilemma: what should I be for Halloween? Add in a boyfriend/girlfriend/husband/wife/significant other and the stakes are even higher– do we wear a “couple’s costume” or do our own thing? If you decide to go with the latter (it’s more fun that way, right?) 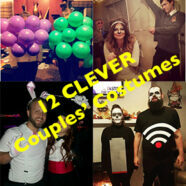 you probably want costumes that are clever, unique, and EASY for you and your significant other this Halloween. Luckily, we have 12 costumes rounded up for you to feed your costume inspiration. These Instagrammers came up with their own clever costumes and may just help you get inspired. Be sure to click on the photos of the costumes you love so you can “like” or leave a comment– and then let us know if you’re going to try any of these out! 4. Lightning bolt and person struck by lightning – Definitely a STRIKING costume choice. Funny and simple! 5. Harry Potter and his patronus – A great costume idea for HP fans. You can make this work for any Harry Potter character and their respective patronuses too! 6. Mario and Princess Peach – A classic costume that’s sure to cause nostalgia and lots of photo ops! 7. Wizard of Oz characters – This works for a group costume idea or a couple’s costume– use any variation of over-the-rainbow duos (and don’t forget the Wizard of Oz himself, Glinda the Good Witch, Wicked Witches of the West and East, Dorothy’s house, the tornado, the yellow brick road, munchkins…) and your costumes will be worth skipping down the yellow brick road over! 8. Hunter and deer – And who’s to say it can’t be a female hunter and buck combo? 9. Little Red Riding Hood and the Wolf – Clever, easy, and inspires a lot of variations– Little Red and Grandmother, Little Red and the Woodsman, Granny and the Wolf… There’s probably even some way to do Little Red and her red hood. Get creative! 10. Napoleon Dynamite and Kip – Napoleon is a classic, but pair him alongside his brother Kip (and why not “LaFaunduh,” too, while you’re at it?) and you have a DYNAMITE pair. 11. Popeye and Olive Oyl – A classic duo. Just don’t forget the spinach! 12. Bank robbers – An easy, classic costume that hasn’t been done much in recent years– and won’t require you rob a bank to afford to make the costume! Do any of these costumes inspire you? Let us know in the comments or on social media– We’d love to hear from you on Facebook, Twitter, or Google+! And be sure to give these Instagrammers a “like” and leave a comment if you want to compliment their creativity!